Not everything happening on the U.S.-Mexico border is negative. 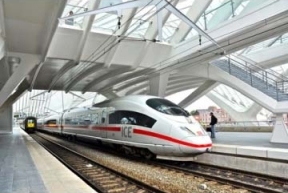 High level U.S. and Mexican officials recently held a meeting to try and hammer out trying to make possible a high speed train traveling directly from San Antonio, Texas, to Monterrey in Mexico. The Mexican side has completed its side of the study on the feasibility on such a train going through Mexico, and the United States has yet to carry out such a feasibility study. Both sides have agreed for a timetable to get the high speed train into operation and running on both sides by the year 2018. The three main problems with the direct access train between both countries are security, immigration checks, and the physical terrain between Mexico and the United States. Currently, it is a five-hour trip by car to get from San Antonio to Monterrey—the biggest problem being the immigration checks at the border between both countries. Both countries will have to work on having each others’ immigration agents working in both countries (i.e. U.S. immigration agents in Mexico and Mexican immigration agents in the U.S. This is currently being done between Canada and the United States). The biggest concern (at least on the U.S. side), will be the security checks. The U.S. government fears that the Mexican drug cartels will try to use this route for smuggling in drugs, weapons and other contraband. It remains to be seen what security both countries can work on to prevent this. The study on the project alone (on both sides of the border) will cost U.S. $5.6 million, and that does not even include the actual building of the network and all the security checks that must go into it. However, both sides think the project is worth the effort. Monterrey is the third largest city in Mexico, and an important economic, educational and industrial center. San Antonio is the second most populous city in Texas, the seventh most populous city in the United States, and an important link to Mexico. At present, there is no direct public transport connection between Mexico and the United States. That is why this high speed train is not only important but a major change from the way both the United States and Mexico enforce security along the border (especially since what happened September 11, 2001). There are many bugs that have to be worked out on this project, but this high speed rail train will be an important step in helping to create a new and hopefully better official exchange of peoples and goods across the U.S.-Mexico border.